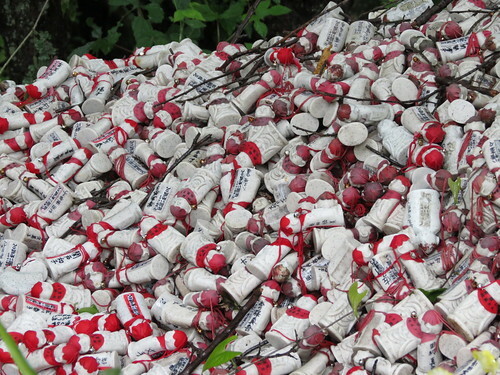 My time in Japan was drawing to an end, but on Saturday 7th June I was on a mission. 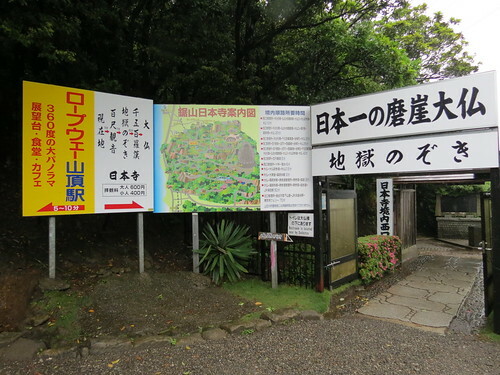 Back in 2011 when I was having my last trip before leaving Japan I was gutted to have to cancel my plans to visit Nokogiri-yama (鋸山) in Chiba Prefecture. 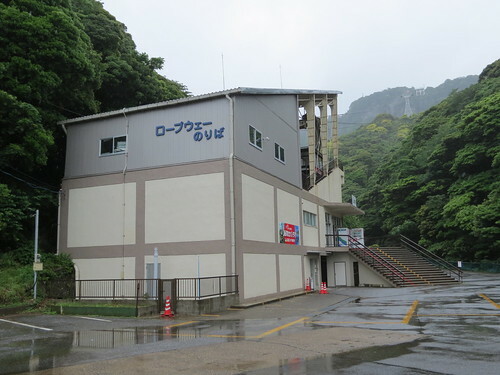 I had planned to go in April, but the aftershocks from the March Tohoku earthquake were a bit of a concern, and I wasn’t even sure if the mountain and ropeway were open. This time I was determined to go, come hell or high water! Well, there was no hell, but there was water… and lots of it. 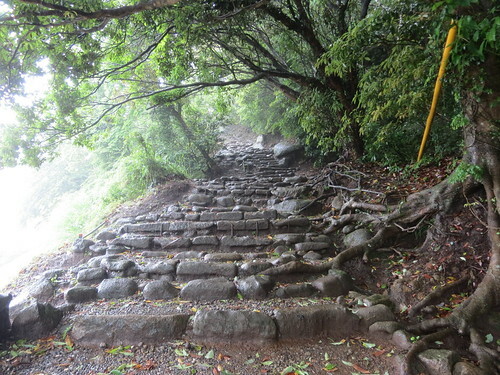 Rainy season had well and truly come that day, but I set off for Chiba anyway. 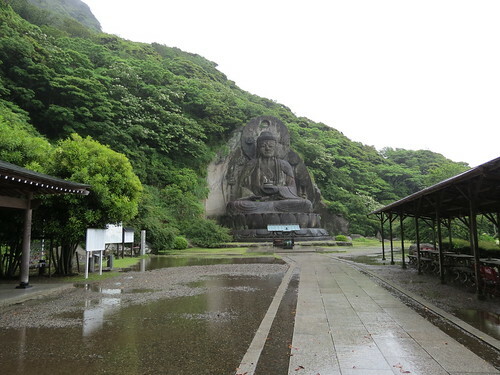 It was misty and muggy, but I hoped the ropeway would be open and I would finally get to visit Nokogiri-yama and the Nihonji Daibutsu (日本寺大仏). 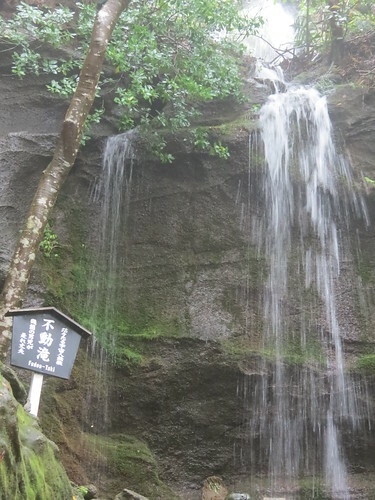 I must say a massive thank you to Zooming Japan for an excellent blog post about Nokogiri-yama which helped me to plan my journey. 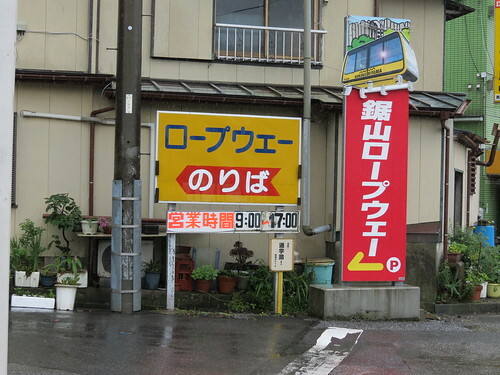 As suggested, I took the train to Hamakanaya Station (浜金谷駅), which was about a 90 minute journey from Kinshicho in Tokyo where I was staying. It was a direct train, and very quiet, so I just sat back and enjoyed the view. 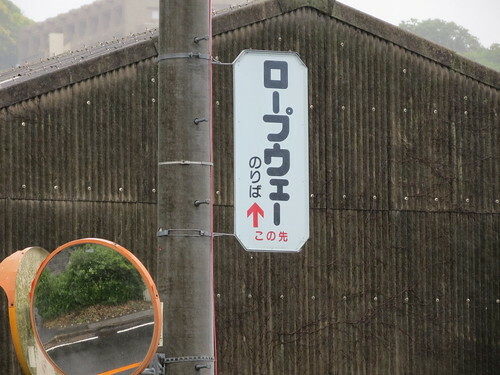 Upon arrival at Hamakanaya Station I had a little bit of a feeling of ‘where the hell am I’, but luckily I spotted some Japanese signs and worked out which direction to head in. 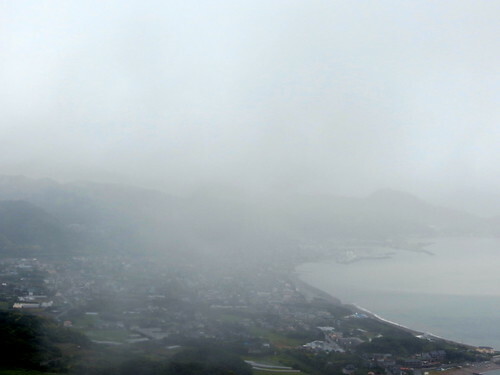 The weather really wasn’t great, but the view out to sea was still pretty cool. 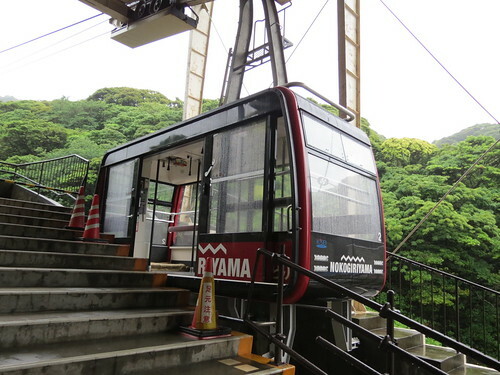 Although Nokogiriyama is a relatively small mountain at only 329 metres, it’s still worth taking the ropeway up. 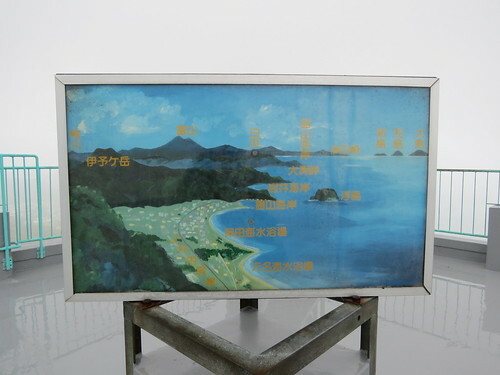 It’s possible to hike, and one way tickets on the ropeway are available, but given the weather conditions I thought it best to stick with the ropeway which was, thankfully, running that day. On a clear day the views would have been beautiful. Instead, I had a rather atmospheric and slightly terrifying journey on my own, dangling in the mist. It really was not a day for hiking. Exiting the ropeway there was a viewing platform and a sign telling me about all the things I couldn’t see. 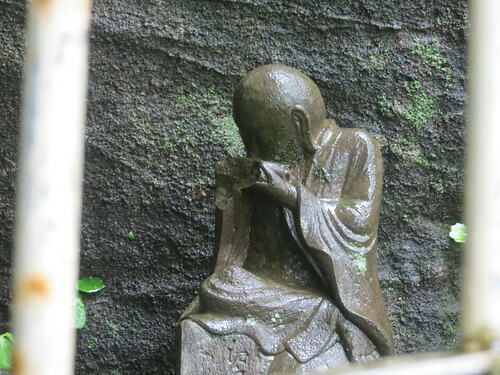 The temple costs ￥600 yen to enter, which I paid to the sleepy man sat in the little booth. Poor guy, having to sit there on his own all day! I didn’t really know where I was going, and the faded signs along the way didn’t help that much, but I just kept climbing like a woman on a mission. 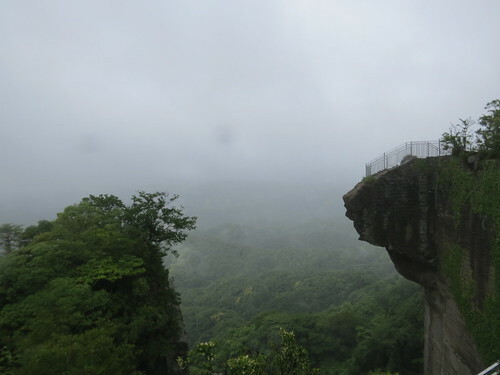 Nokogiri-yama, written 鋸山 in Japanese, could be called ‘Saw Mountain’ in English. 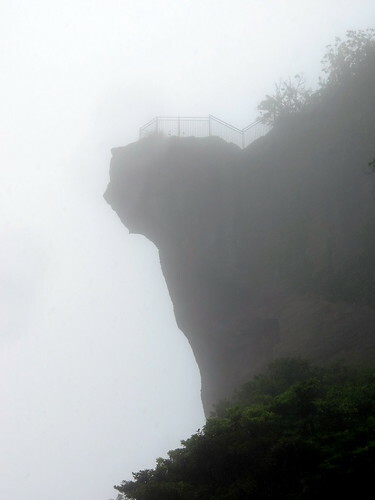 One particular feature of the mountain is its distinctive shape which is said to look like a Japanese saw. 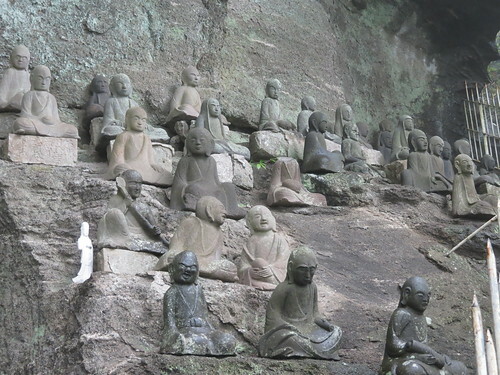 According to Zooming Japan’s blog, the “shape was formed in the Edo period. 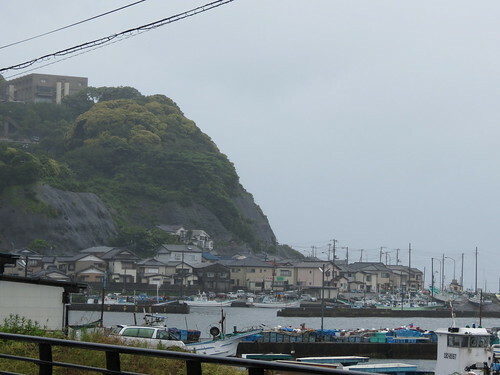 People worked hard to build the biggest city of Japan, but there was only marshy land, so solid rocks were necessary to create a strong foundation for the buildings of Edo. 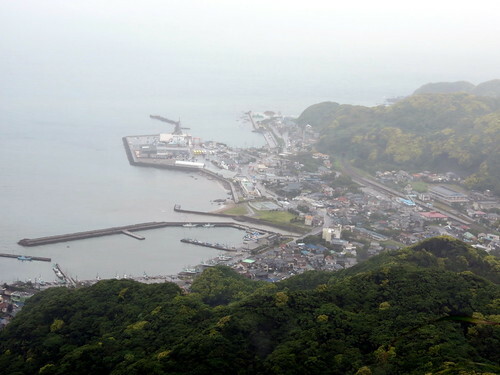 Mount Nokogiri’s current shape clearly shows the hard work of all those people.” There is a part of the mountain which juts out, which is called Jigoku-nozoki (地獄覗き) or ‘peering into hell’. Given the weather and the fact that I was on my own, I was a little nervous to approach to be honest! 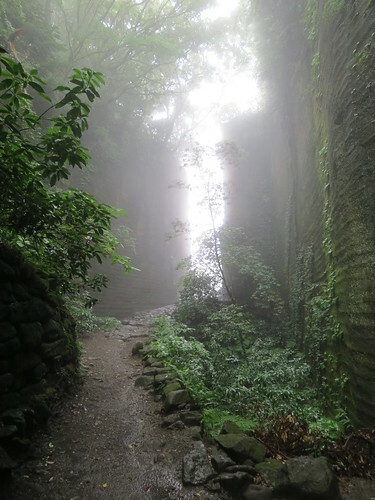 The rain continued to come down as I followed the paths and steps blindly, sometimes up, sometimes down, I felt like I could easily be lost! I gave up trying to use my umbrella as an umbrella and started using it as a stick to help me walk on the wet stones. 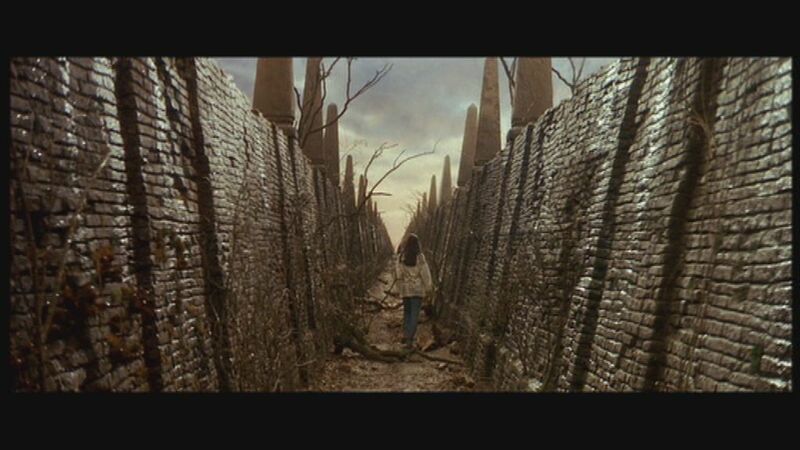 I’m not sure which path I took, but suddenly I realise I wasn’t alone (actually, I felt a little bit like I was in The Labyrinth). 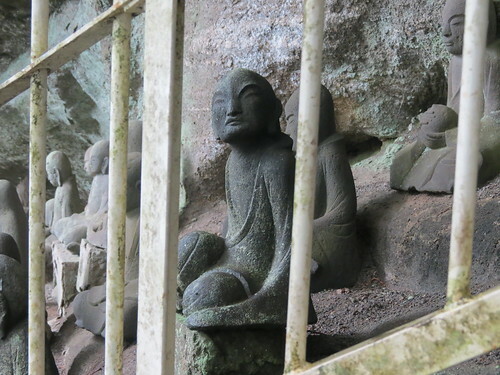 All around me were small Buddhist statues, watching me. 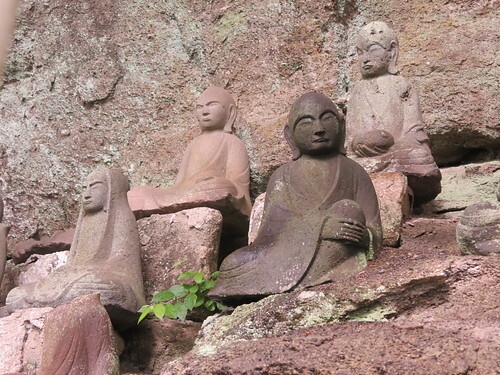 I’ve read various things about these intriguing stone statues, each with a different expression on their face, but according to the leaflet I picked up at Nihonji they are the ‘1,500 stone figures of Tokai Arhats’ (東海千五百羅漢道). In other places I’ve seen these referred to as ‘Rakan’ rather than ‘Arhat’, but I believe these are actually one and the same (based on what I’ve read here). Do correct me if I’m wrong! 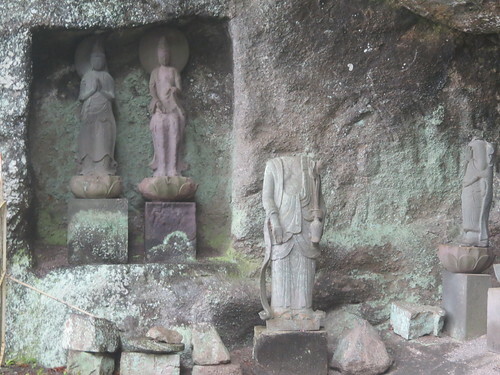 Unfortunately a lot of the statues were damaged and many beheaded during the anti-Buddhist movement in the Meiji period. 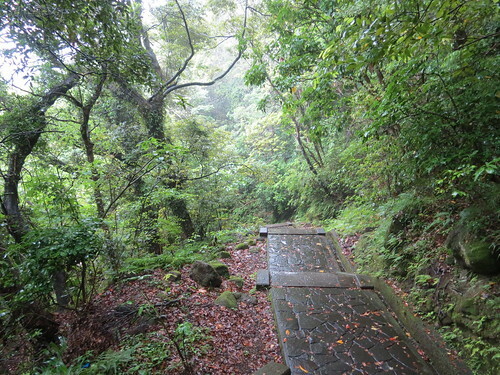 I continued my hike, if you can call it that, as the rain came down. 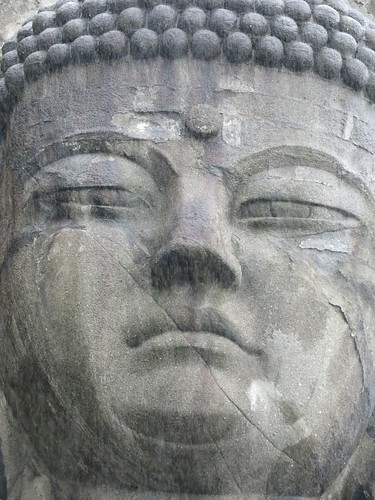 As much as I was enjoying the experience and really wanted to see the daibutsu I had come to see, I was having to walk very carefully and was starting to think that perhaps I was a little bit mad. I reached a junction, knackered, soaked, and cursing my determination. Then I turned around, and there he was. I had him all to myself, and it was perfect. 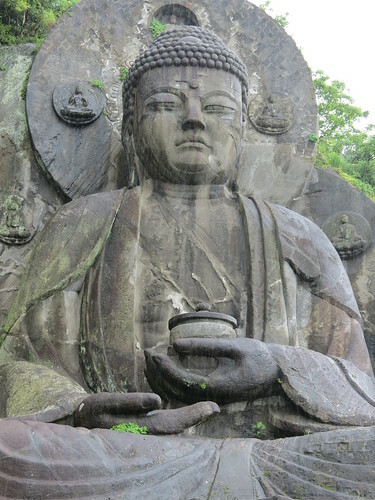 I love big Buddha statues, and I was so relieved to have finally found this one. 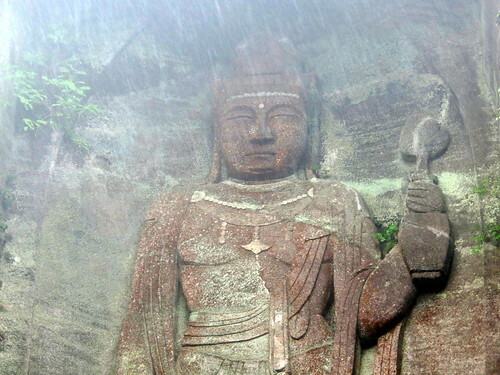 The Nihonji Daibutsu is 31.05 metres tall, which is 12.87 metres taller than the Nara Daibutsu at Todaiji. 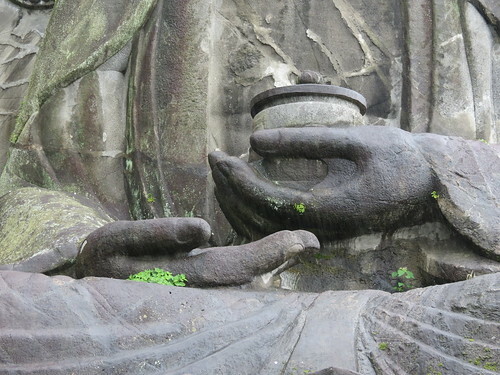 Actually, it’s the tallest daibutsu in Japan. 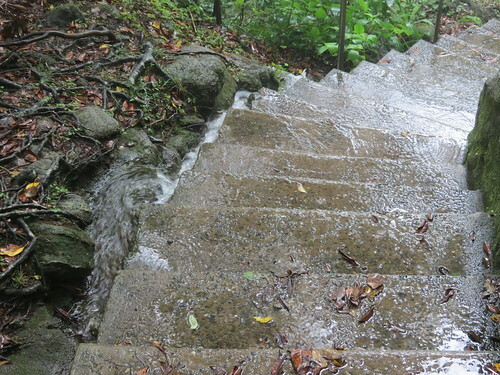 It was impressive, perhaps even more so because I was all on my own and the rain was still coming down. 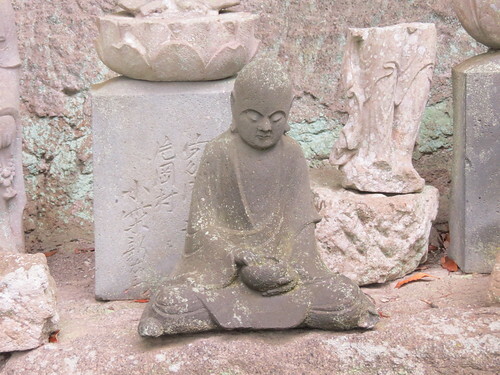 This statue is a representation of Yakushi Nyorai (the Medicine Buddha). It was built originally in 1783, and restored to its current glory in 1969. 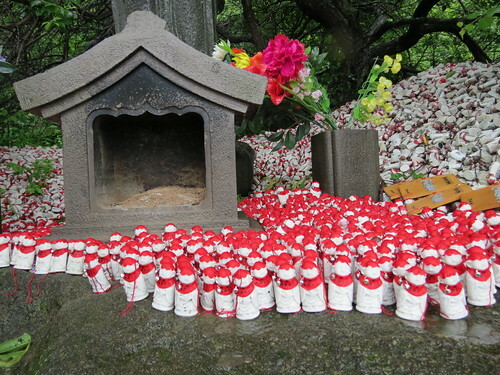 There wasn’t much else to see in the area, but there were some other smaller statues, piles of Jizo figures, and a shop selling omamori (lucky charms). Although seeing the Nihonji Daibutsu felt like the climax of my adventure, I still had one more thing to see: the Hundred-shaku Kannon (百尺観音). 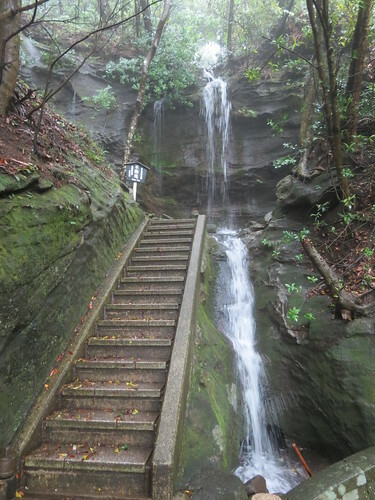 On the way, as the rain continued to fall, I saw a fantastic waterfall called Fudou-taki (不動滝). 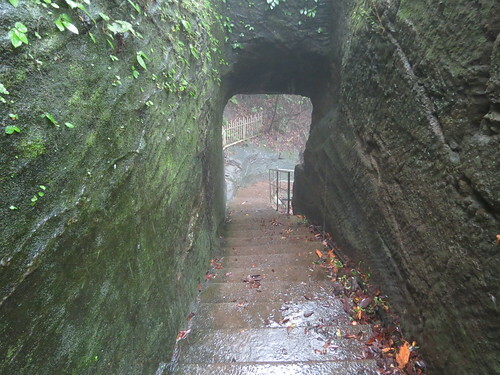 Approaching the entrance to the Hundred-shaku Kannon I really felt like I was in The Labyrinth! 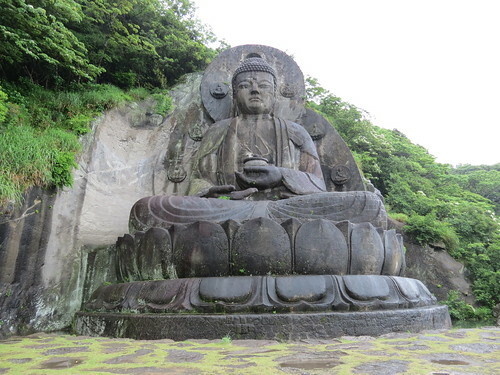 The Hundred-shaku Kannon is so called because it is 100 shaku high. Shaku (尺) is an old Asian unit of measurement, with w length approximately equal to a foot (about 11.93 inches). 100 shaku is about 30 metres. The statue was built in 1963 and is dedicated to the soldiers who died in World War II. 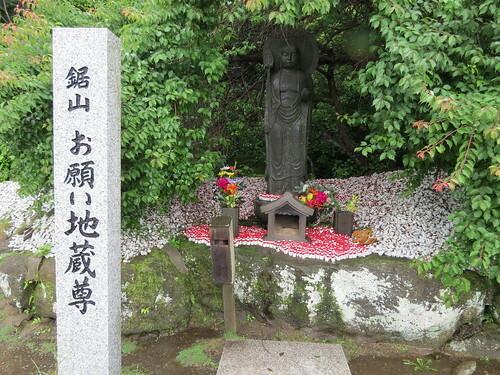 It is located underneath the Jigoku-nozoki, which you can see from where the statue is. 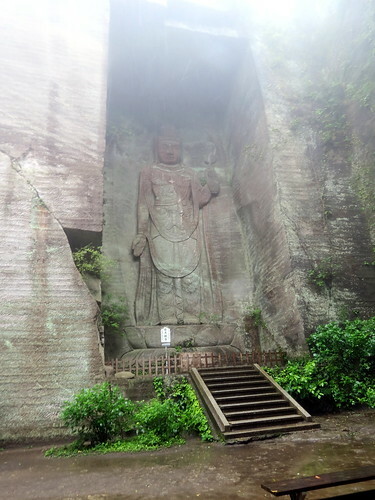 Although I couldn’t see it as well as I had hoped, seeing the Hundred-shaku Kannon really was the icing on the cake of my day. 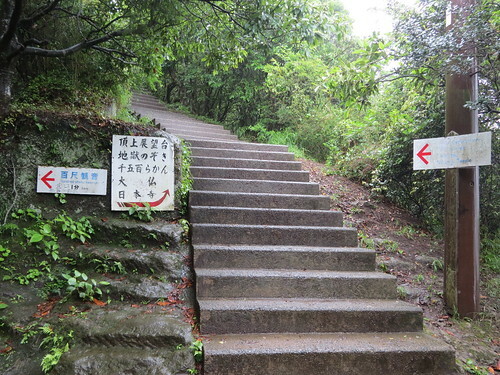 As I made my way carefully back along the slightly treacherous paths and back down the ropeway, I was so pleased I hadn’t let the weather put me off. Adventuring is such an important part of travel, and although I was literally soaked to the skin by the time I got back to my hotel, every moment of my adventure was worth it! Wow! I would love to do this hike. 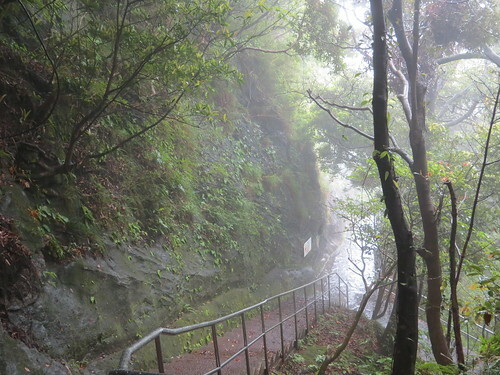 Hiking this on your own..amazing. Thanks for sharing. Thanks for stopping by, Peggy! It was a pretty awesome adventure! Thanks Spencer! I think you’d like Nokogiri-yama!